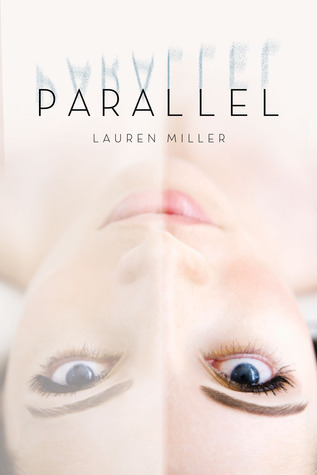 Book Review: Parallel by Lauren Miller - Book.Blog.Bake. Whoa, this book loves to twist your mind. I’m not even sure how to review it without giving anything way because it’s incredibly layered and one of the main themes of this book is how everything is interconnected. We can’t truly differentiate between “small” decisions and “big” decisions because there is no such thing as a small decision. I really appreciated the way this book assumed intelligence on the part of the readers to follow the logic behind how Abby’s choices affected her two parallel selves. I think it’s safe to say this book is science fiction, with the parallel universes and all, but at heart I think it feel a lot more contemporary than I expected at first. Abby has to deal with going back and forth between the parallel version of events, but a lot of the conflict centers around family, friends, and boys. Speaking of, I really liked the way Abby’s friends and family members were portrayed as fleshed-out characters of their own. Caitlin is a supportive best friend, though I will say I thought her character was just a tad overdone. She’s incredibly smart(a scientific genius, really), looks great all the time, and has one academic flaw(dyslexia). Caitlin’s character felt a little to characterization-by-the-book for me, but Caitlin and Abby do have a really solid friendship that I enjoyed reading. Abby’s family isn’t a huge part of the book, considering for quite a bit of it she’s away at college, but during the events when Abby was in high school, there were no cases of the mysterious absent parents here. I will warn that there is a love triangle in this book. I didn’t mind the triangle at all though because it’s not really a triangle. . . more of a parallelogram? Because Abby has a love interest, and her parallel has a love interest, so they interact with each other(I’m not good at explaining this, but the book does a slightly better job, though you definitely have to stop and think about it). So even if it’s not exactly a love triangle, there are two love interests. They were both all right, but I really liked one(Josh), while finding Michael just kind of . . . meh. He wasn’t a bad character, but he did seem kind of bland. Even though Parallel was a page-turner for me, I will say this is a book I would only recommend on certain conditions. I really liked it, but I think it’s going to be a polarizing book–I don’t see many people being on the middle ground with this one. So, a few warnings of things that came up in the book that I think might be off-putting to some people: there’s talk of soul-mates(it wasn’t instalove or sickening like I sometimes find this concept, but I know some readers really don’t like those words), all the kids are really, really smart(a little unbelievably so), and this book does sort of mess with string theory, which doesn’t bother me because I know nothing about string theory, but it might ruin the experience for you if you actually know your physics. The Ending to this book was definitely a “whoa, what just happened?” moment in a good way. It was so twisty and awesome–it might be one of my favorite ending I’ve read in any book this year. It’s perfect. I liked the book a lot going into the ending, but the last few paragraphs erased any remaining doubts in my mind that this was an awesome book. Final Impression: Parallel was not at all what I was expecting it to be, but I really enjoyed it. It was less sci-fi than I thought it would be, but I actually enjoyed the way Abby interacted with her friends, family, and the male characters. It was a page-turner and I never wanted to putting down. Also: BEST.ENDING.EVER(OK, maybe not ever, but I really like it). Really 4.5 stars, but 4 stars for categorization’s sake. You can find Parallel s on Amazon or Barnes and Nobles. I don’t normally like book trailers, but I thought the one for Parallel was fairly good, so if you think you might like the book, I would recommend watching it. Top Ten Tuesday: Top Ten Books I Read in 2013 - Book.Blog.Bake. I’m not a book blogger, but I found your review on goodreads & appreciated the things you mentioned! I was really surprised to see some of the negative reviews, but I suppose the love triangle, the overly smart characters, and the rude way Ilana was treated were turn-offs for some. Those aside, I read this book in just a couple of days and could not wait to see how the author tied it all together! I agree with your feelings of Josh vs. Michael. Also, the ending was really satisfying in my opinion (especially because I was afraid the ending would somehow ruin the book for me!). Thanks for such an enjoyable review! YA Debut Author Bash: Interview with Lauren Miller + Giveaway! - Book.Blog.Bake. You’re probably right about this book being pretty polarizing, though. So far I’ve read your review, and then one negative review. So my reading experience should be interesting! I’m even more excited about this one now that I’ve read your review, and I’m really glad you loved the ending! 🙂 Great review! Wow, that summary definitely got me interested. What the heck is going on here? And I’m glad to see you enjoyed it. I haven’t heard of this one before, but I would love to pick it up. The things you warn might be bothersome probably won’t bother me, and I’m curious about what the big twist is. Great review! Yeah, none of that bothered me either, but I know it would some people. It’s definitely worth a read! It really has–I already want to re-read and I’ve only read like 3 or 4 weeks ago. And it’s a very quick twist ending–only within the last PAGE(like 3 paragraphs) did everything fall into place. It’s become one of my favorite endings.